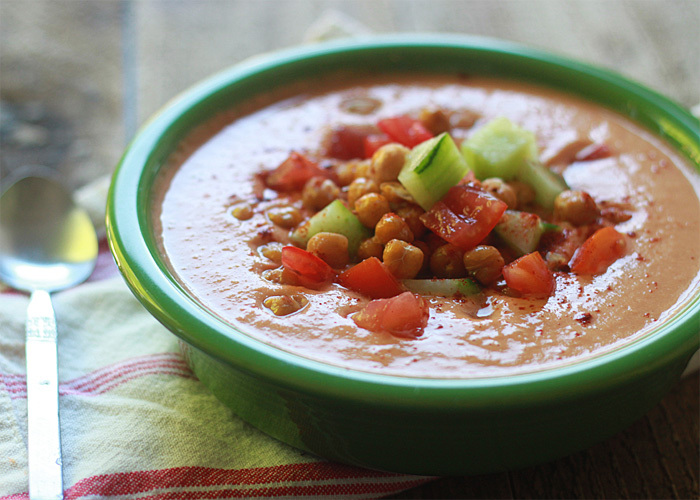 Chickpeas and tahini lend an addicting creaminess to classic gazpacho. Cool, refreshing, and hearty – the perfect summer dinner! Forever and a day ago, I was chatting over a bowl of restaurant gazpacho with a good friend of mine. She had spent some college time in Spain, and it was there she learned that authentic gazpacho has stale bread in it. “Bread!” I thought. “Gross!” I thought. “Uncool,” I also thought. Okay, so I had a lot of one-word thoughts about this whole thing. I was not a fan of this hare-brained idea, hmmph, soggy bread in cold tomato soup. No freakin’ thanks. But I convinced myself (quite easily, I admit) that I was not eating an authentic, bread-logged version, and polished off my bowl. Gazpacho is a refreshing chilled summer soup made with garden tomatoes, cucumbers, garlic, and other tasty veggies. If you’ve never been inclined to try cold soup, I beg you to try gazpacho. You’ll never look back. And honestly, I now know that you probably won’t be able to tell if yours has bread in it. It’s used to add thickness and body to the soup. And I can totally appreciate that it does that. But if I’m making soup at home, bread is going to be a dipping mechanism only, thanks. And up until a few days ago, I was fine with enjoying my own homemade gazpacho on the breadless, thinner side. Until. Until! I had an idea. What if. What if!!! I blended a few chickpeas into the mix to add that thickness and body back into the mix? And even better? What if I added other classic hummus ingredients, too?! Some creamy tahini; lemon juice. Garlic. Cumin. And a few roasted chickpeas on top for good measure. 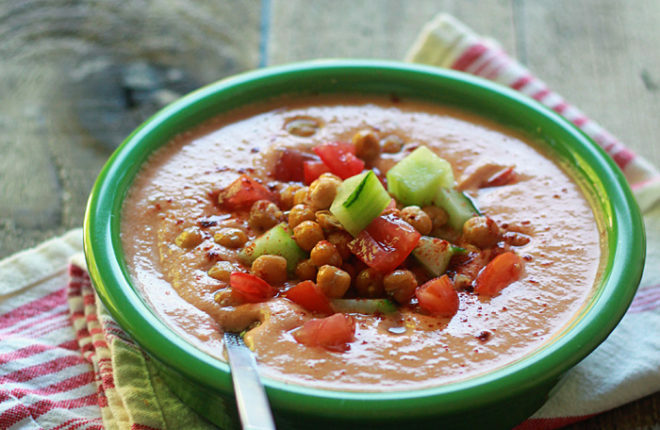 Creamy Chickpea Gazpacho was born. To give credit where credit is due, I was inspired by this stunning soup from Andrea, the wonderful farmer-blogger over at Dishing Up the Dirt. 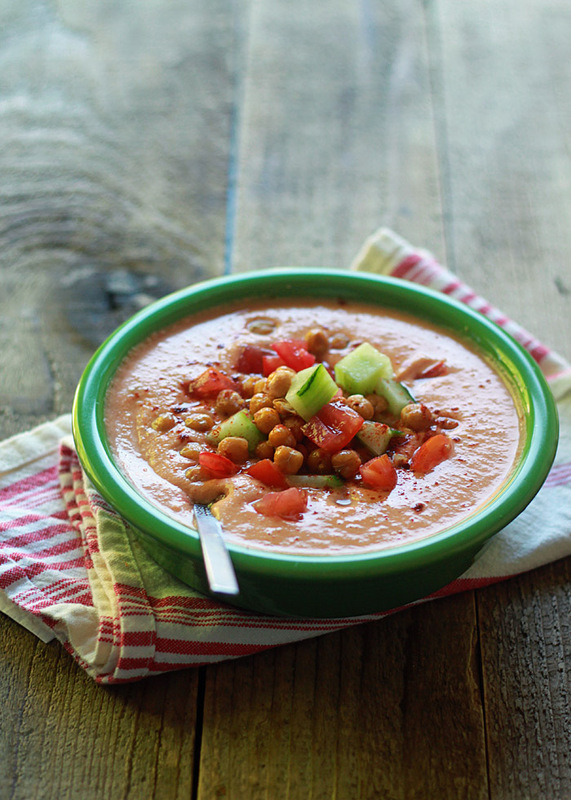 It wasn’t much of a leap to take her blended-in tahini and chickpea topper over to gazpacho land. Thank you, Andrea, for inspiring me to chickpea-up some cold soup! I think this soup is pretty wonderful, and it’s not just because I’m biased and semi-blissed-out by its breadlessness. The chickpeas and tahini lend a creaminess that makes this soup pretty dang addicting. A shallot adds a bit of heat, garlic lends its signature bite, and lemon makes it zing. 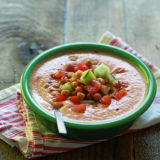 Creamy Chickpea Gazpacho Soup is one of the best ways to enjoy fresh-off-the-vine summer tomatoes, and that time is now, my friends! My gosh, I love tomato season. Bring ’em on. In every color of the rainbow, please. 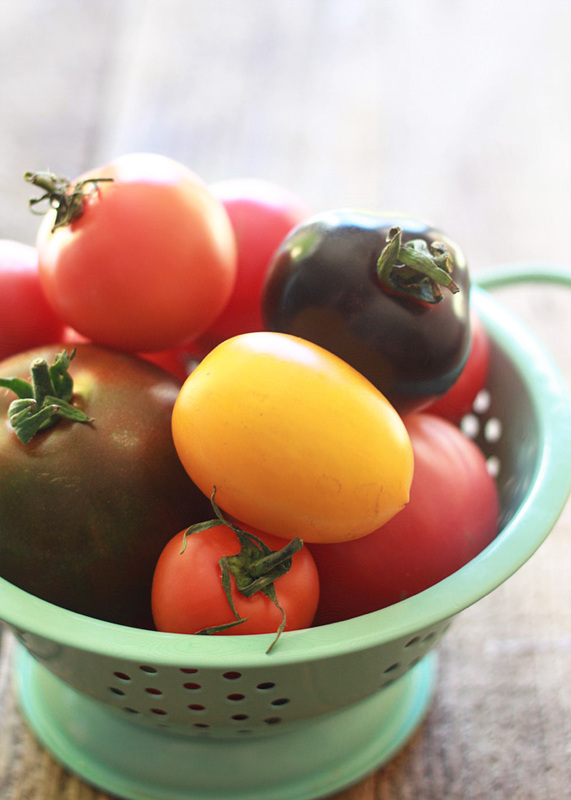 And then I’ll whir them into chilled summer bliss, piled high with salty-crisp roasted chickpeas, diced tomatoes, and crisp cucumbers. This soup will be happening a lot this summer. Bread on the side. Add 1/2 cup of the chickpeas to the pitcher of a blender. Rinse remaining chickpeas. Spread a couple of paper towels on a rimmed baking sheet and spread chickpeas on top. Gently blot tops of chickpeas with additional paper towels until they’re relatively dry. Place the dried chickpeas in a bowl and drizzle with 2 teaspoons olive oil. Sprinkle with a couple of pinches of kosher salt and toss gently until coated with oil and salt. Discard paper towels and pour chickpeas onto baking sheet. Bake until golden and slightly crispy, 25-30 minutes. While the chickpeas are roasting, make and chill the soup. To the 1/2 cup chickpeas already in the pitcher of the blender, add the remaining ingredients (aside from toppings). Puree until smooth. Taste and add additional salt and pepper if desired. Place in an airtight container and refrigerate until very cold. Ladle into bowls and top with cucumber, tomato, roasted chickpeas, and a light sprinkle of smoked paprika. Serve. Your gazpacho is simply gorgeous. 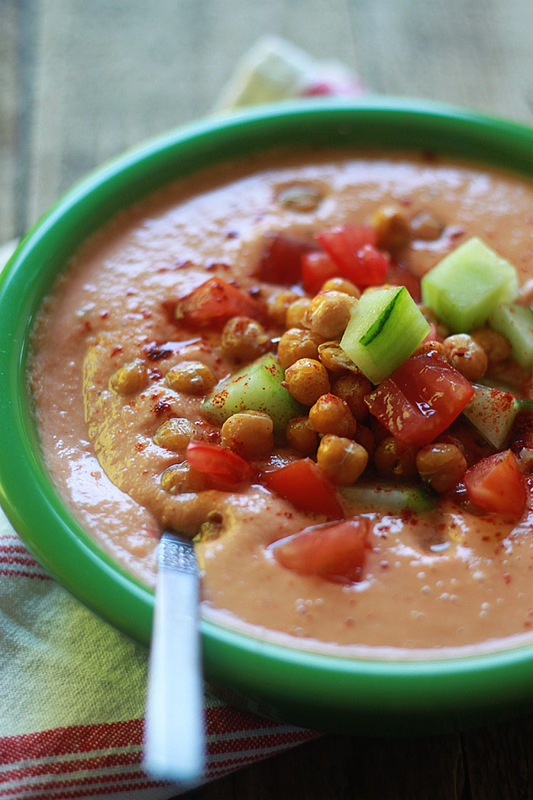 Blending roasted chickpeas into gazpacho is brilliant… Sounds like a great one-dish meal! looks delicious! never would have thought to make a chickpea gazpacho.. only ever made tomato before! definitely need to try the recipe. Even though I’m okay with and have prepared gazpacho at my parents’ using bread before this version is awesome. I hardly ever keep bread in my apartment but am a huge chickpea fiend so I have almost all of these ingredients at hand at any given time. I can’t get over how creamy and delicious your gazpacho looks! Looks super yummy! Great way to use up some fresh garden veggies. This recipe sounds great! And if it were not over 100°, or, I had an air conditioner, I’d make this in a heartbeat! I’ll definitely make this as soup is a favorite. Like the change in name of the recipe as it makes it sound much less like eating a bowl of hummus… which i could also do in a heartbeat! Love hummus. I have everything to make it, now, I just need a little break in the heat to give it a try… or, simply skip the roasted chickpea topping… That’d work, too.